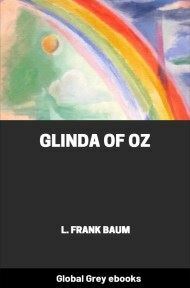 Glinda of Oz is the fourteenth and final book in The Oz Series written by L. Frank Baum. This was Baum's last Oz book, and was published posthumously. 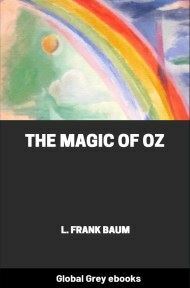 Most critics agree this is Baum's darkest Oz book, most likely due to his failing health. It is the last book of the original Oz series, which was later continued by other authors. Like most of the Oz books, the plot features a journey through some of the remoter regions of Oz; though in this case the pattern is doubled: Dorothy and Ozma travel to stop a war between the Flatheads and Skeezers; then Glinda and a cohort of Dorothy's friends set out to rescue them. Presently among the fields an object was seen moving, threading the broad path that led to the castle gate. Some of the girls looked upon this object enviously; the Sorceress merely gave it a glance and nodded her stately head as if pleased, for it meant the coming of her friend and mistress—the only one in all the land that Glinda bowed to. Then up the path trotted a wooden animal attached to a red wagon, and as the quaint steed halted at the gate there descended from the wagon two young girls, Ozma, Ruler of Oz, and her companion, Princess Dorothy. Both were dressed in simple white muslin gowns, and as they ran up the marble steps of the palace they laughed and chatted as gaily as if they were not the most important persons in the world's loveliest fairyland. "You are most welcome," said Glinda the Sorceress, and led them through the court to her magnificent reception hall. Ozma took the arm of her hostess, but Dorothy lagged behind, kissing some of the maids she knew best, talking with others, and making them all feel that she was their friend. When at last she joined Glinda and Ozma in the reception hall, she found them talking earnestly about the condition of the people, and how to make them more happy and contented—although they were already the happiest and most contented folks in all the world. This interested Ozma, of course, but it didn't interest Dorothy very much, so the little girl ran over to a big table on which was lying open Glinda's Great Book of Records. This Book is one of the greatest treasures in Oz, and the Sorceress prizes it more highly than any of her magical possessions. That is the reason it is firmly attached to the big marble table by means of golden chains, and whenever Glinda leaves home she locks the Great Book together with five jeweled padlocks, and carries the keys safely hidden in her bosom. I do not suppose there is any magical thing in any fairyland to compare with the Record Book, on the pages of which are constantly being printed a record of every event that happens in any part of the world, at exactly the moment it happens. And the records are always truthful, although sometimes they do not give as many details as one could wish. But then, lots of things happen, and so the records have to be brief or even Glinda's Great Book could not hold them all.